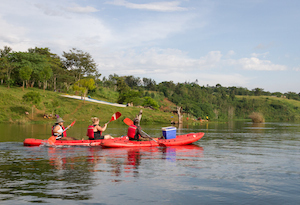 ADRIFT - the most popular and respected adventure operator in the country is comprised of an expert local and international team with over 30 years of worldwide rafting and adventure experience to guide you through Uganda's most authentic and unique activities on the River Nile. Adrift has an unparalleled safety record that is both unrivaled and admired, and we aim to keep it this way. We thank over 58,000 customers who have safely rafted the Nile with us, including Prince William, Ginger Spice, Mikka Hakkanen, Ewan McGregor and Charlie Boorman. Leading the way, Adrift made the first-ever descent of the Nile river in Uganda in 1996 (10 years after first scouting the river) and hit world headlines before introducing commercial whitewater rafting to the country. 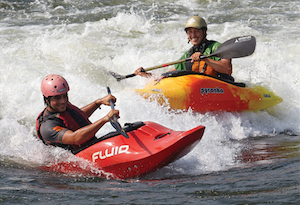 Heart-pounding whitewater rafting excitement is unequaled anywhere on the planet! 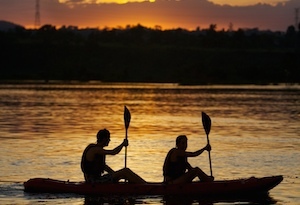 Adrift’s one-day rafting trip is the most popular ride on the Nile. Our family white water rafting trips let you sit back and relax as our guides take over entertaining your kids! 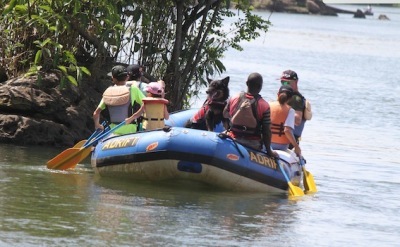 At Adrift we specialise in white water rafting for kids. We’ll ensure that your kids are having the time of their lives, but also make sure they are learning about the river and taking safety seriously. Truly memorable full day experience for a slightly less strenuos day. Drift amidst the breathtaking scenery of Wildwaters Reserve on the world’s most famous river. Marvel at the birdlife and raft through the breaking waves. Warm water, sunshine, tropical islands and the perfect introductory rapids makes the Nile the perfect place to learn how to whitewater kayak. Our Introduction to Whitewater day is conducted directly from WWL and is sure to give you a memorable experience off the tourist trail. The day is designed to teach the skills you need to run a fun white water section on your first day. 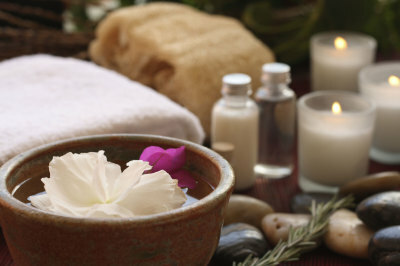 One of our highly qualified guides will be with you every step of the way. This is our most popular option. 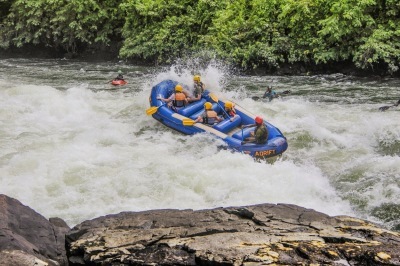 This experience is offered on the smaller whitewater at the base of the Wild Waters Lodge island. Done on our more stable Sit On Top Kayaks this is a taster as to what white water kayaking is, it gives you the opportunity to interact with the river around you and get a feel for the rapids. You will be guided through some mild white water and might end up for a quick swim in the river, but there will be safety kayakers to help you back into the kayak. A fun, safe and exciting activity for the whole family. Watch the sun as it settles over the shores of Lake Victoria and the River Nile ! The excursion includes 1 sundowner drink. 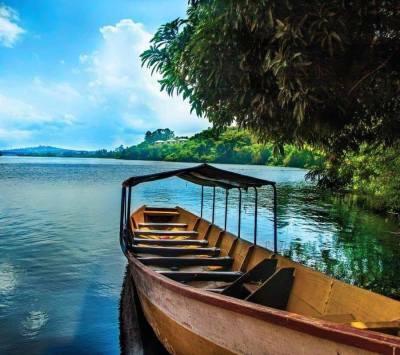 Start on Lake Victoria motor on by and enjoy the sites of the 1st Harbour ever built, continue through to the Source of the Nile. If you have your own gear, there are some “worth a try” fishing spots around the island that we are happy to guide you to. For some reason, the guys with the long bits of wood and fishing line do a lot better than we do with the fancy kit, so we suggest asking for a few pointers. Our short safaris generally start at 10am and 2pm each day, but it is essential that you pre-book your safari so we can ensure horses and guides are available and ready when you arrive. This ride is for groups of friends and family with a range of abilities who want to ride together. 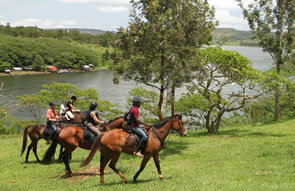 There are various opportunities for cantering, and the ride takes in the local village and a section along the Nile. 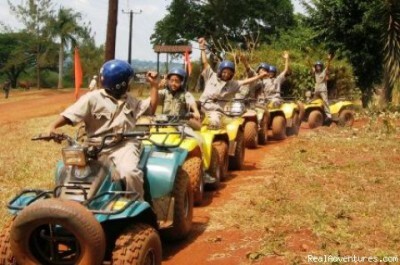 We offer riding safaris for the less experienced and for the more experienced, overnight safaris. Free training practice session then 2 hour Safari. this is the most popular trip. Easy trails make up the start of the trip and then we have the option of more 'technical' sections if suitable. 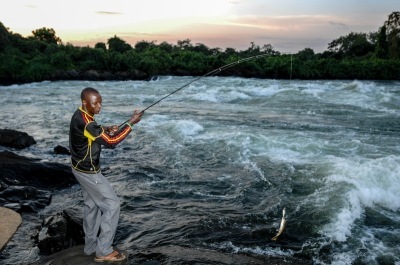 We follow the Nile downstream from Bujagali Falls, below the dam site and then away from the river banks, through the farmland and forest of rural Uganda.